The HOD meeting is an exciting place, where every AMTA member’s voice can be heard through their chapter delegate. It is a place of passion, where amazing work is done that affects the future of AMTA and the massage therapy profession.The 2014 House was filled with both passion and professionalism! The 2014 House of Delegates (HOD) was probably the most efficient HOD that I have had the opportunity to participate in. I was extremely impressed with the new Moderator, Lee Stang from the CT Chapter. Dan Barrows was missed, but his quiet presence was in the room during the proceedings! The debates for the Position Statements and Recommendations was what was expected. In particular, the debates regarding the Position Statement for Portability and the Recommendation for restoring chapter fees promoted great commentary for both the PRO and CON viewpoints. In the end, the Recommendation for restoring chapter fees was overwhelmingly passed, while the Position Statement regarding portability did not pass. The majority of the debate surrounded around the general lack of a definition of Massage Therapy and disparity of certification and licensing requirements state to state. Delegates were in agreement that in concept it is a great idea, but a lot of groundwork needs to be accomplished before it becomes a reality. 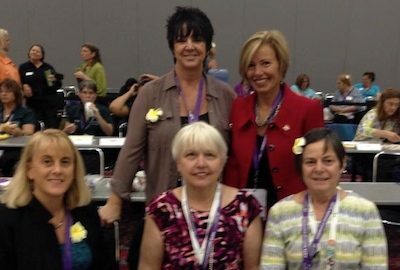 The House of Delegates met once again at the National AMTA Convention. One position statement in particular was of interest to me - "It is the position of the American Massage Therapy Association (AMTA) that massage therapy can assist in the rehabilitation of burn scars." As many of you know, I do this work with burn survivors and it is enormously beneficial to soften and thin and make their scars more pliable. It also helps to decrease pain & itching, and increase their joint mobility. The problem is that there were only 10 research studies cited that have to do with massage and burn scars. Although I would have liked to have seen this position statement pass, the HOD correctly voted it down to the lack of sufficient research. I expect this position statement to come before the HOD again when there is more research to back it up. Regine and I were not in favor of the Health & Wellness statement - it was the first position statement voted on. We weren't on our feet quick enough to object -then it passed. Live and Learn! I spoke to Donna, a New York delegate later in week, she was also mystified with the process - so first timers had a rough time. Otherwise, we got through the business at hand; next year I will know what to do! Although as an Alternate I wasn't able to participate in the voting it was a great experience because I was a sergeant at arms this year. This meant that I collected badges and voting machines in case any of the delegates needed to leave the floor for any reason. It was great to be a part of the day and I encourage members to consider running for Delegate or Alternate and be part of the process! The House of Delegates (HOD) meeting was again a unique and exciting experience for me. Efficiency and knowledge rule during these meetings. Once a position statement has been presented and read to the assembly, a twenty minute discussion period starts. There is one microphone for the supporters and another for the opponents, each of them speaking alternately. Each speaker has 2 minutes to present his/her view point. After twenty minutes the discussion stops and can only be started again by a proposal and vote. Before the meeting, delegates have to read or watch a video on the procedures. The first time at the HOD, last year for me, can still be confusing. It was great to watch the speaker, Lee Stang, be in charge of the meeting with efficiency. Once all the delegates are seated, a quorum is being taken and votes for 50% AND 2/3 are defined. What is the ideal leader? A good man speaking well, according to Coriolanus in Roman times. This qualification has not changed, except nowadays we would include women as well. The first PS to be brought before the forum was the Health and Wellness. Discussion was called for, but nobody stood up for a little while, so that a delegate had time to call the question, a move that ends discussion right away. The vote whether to start discussion again was voted against. The PS was accepted with only 20 opposing votes, a disappointment for Cynthia and me. We were of the opinion that not enough evidence for the social well-being was presented in the PS. In order to present our opposition, we should have been faster standing at the opposition microphone. We are not here to look at the obstacles, but the acceptance would show a goal towards which to work. Con: There are no common guidelines on education, training and requirements for the MT profession. AMTA has no control over state legislators and not all Mts are AMTA members. Recommendations: Change on reimbursement for delegates. I was amazed that many chapters spoke against adopting this recommendation. Arguments were that a flat fee would not address States that are far away and Nationals could dictate how we spend our money, while proponents argued that small chapters cannot always afford to send all their delegates and that with the decision of the National Board, chapters have less money to spend. On changing the purpose of HOD: some were of the opinion that we don't have enough education to understand all the research presented in the Position Statements, so delegates might not be the best in our profession to decide on these issues. Opposition said that the HOD was founded just for this reason and has dealt with the PS for several years, where arguments showed that many delegates understand research well. Get chapter fees back: Since the chapter volunteers do the bulk of work, they should be not be burdened with extra lobbying duties for money. Some chapters lost 50% of their revenue, for the MA chapter that means $ 90.000. Let us hope that the National Board of Directors will listen to its members' wishes.